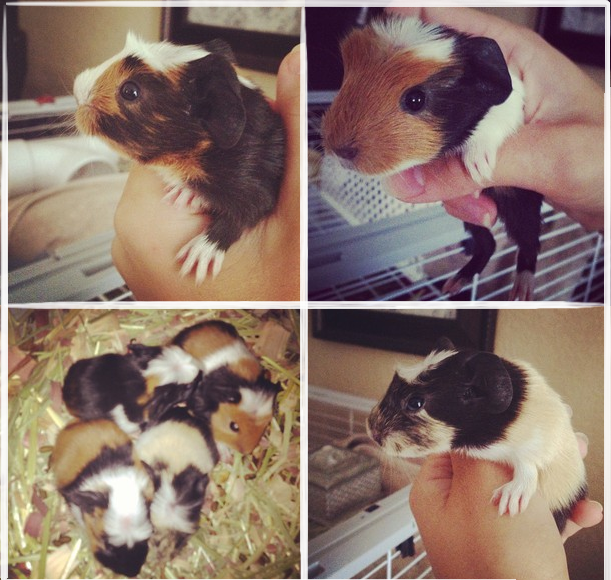 So my brothers got two "FEMALE" guinea pigs for Christmas last year. Last week we noticed one of them was huggggeeee and pear shaped and yep, you guessed it, pregnant. After a ton of researching we seperated the male because the male will eat the babies when they are born...what the what?!? We have been checking for babies nonstop everyday, and at 6am this morning my mom runs into my room with a baby in her hand. There are 4 cutey babies total, and I wish I could take them all to Germany with me. They were born with fur, eyes open, with bodies the size of matchbox cars, and fully aware of everything...so weird!